It’s always an unknown, how a cow will respond to being milked. while she stands patiently, and is milked. I don’t even need to lock her into the headstall to prevent her from backing up. She knows, and is comfortable with the whole routine. It’s an expected part of the day. If I don’t come soon enough, she will stand at the gate waiting for me, with large patient eyes. No fuss, no mooing, no impatience… she just “waits”. I open the gate, and she marches right in. I don’t even need to put up a paneled run to make sure she doesn’t “escape” and go somewhere else. She knows right where she wants to go, and we are on the same page. I run through my head of all the possible “problems” and things I need to get ready “just in case” we run into one of those problems. She could be frightened of the milking trailer… you go from bright sunshine into a shadowy area; it’s spooky to a cow. 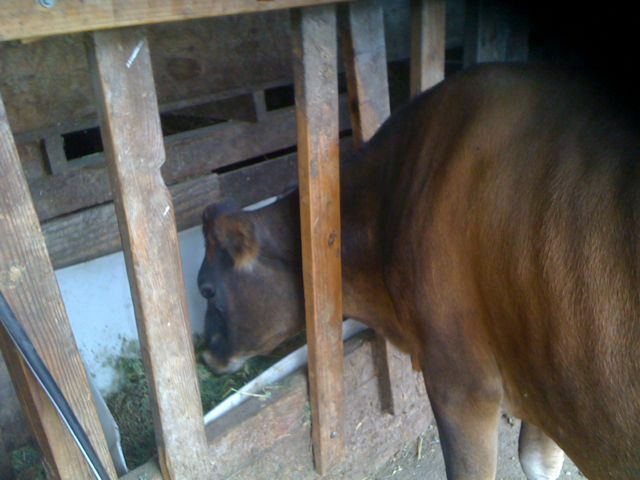 The smells should be OK… calm cows have been in there before her so have not left the “scent” of fear/anxiety/stress. 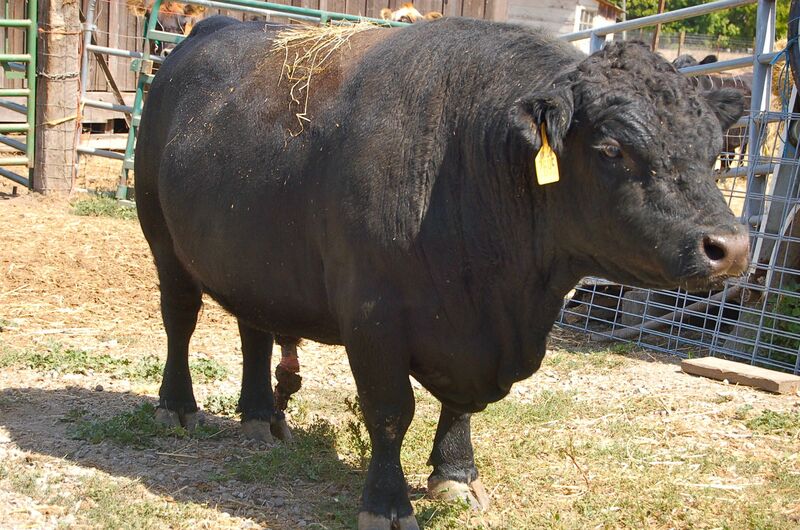 (Under stress a cow will shoot out a VERY icky, smelly, liquid poop! guaranteed to tell the next cow, DANGER). She might not like the confined feeling of the trailer, or she may not like the hen who is trying to nest in her food/hay in the head stall (a BIG problem… I have no idea why the hens seem to think that is the optimal place to lay their eggs)! I have even seen a hen squawk so much, when her “laying time” is getting interrupted that Bessie will back out and WAIT until the hen is done! Quite funny to see a 7 lb hen, dictate timing to a 1000 lb milk cow! And then the big problem that must be ready for… what if she’s a kicker? or a tale swisher. We’ve had a cow before that would just wait (and remember… they can keep one eye on you AND one eye on their food, AT THE SAME TIME)…until you are in position and let loose a kick or swatch your face with her tail. (Oh yes, they can hit a fly at 30 paces, I swear! they are so accurate with that tail). Heaven help you if that tail is a bit yucky with manure… ’cause you are sure to wear it, if she’s that kind of girl! Our 9 yr old standard Jersey… Bessie is as mellow as they come, and she is a treasure to work with… very, very good for beginners to start with. But like I said, a new cow is just unknown territory. A beef cow… you can’t get anywhere near their udder… unless you have them locked down in a squeeze chute where they absolutely can’t get away from you. Amazingly… they never have ANY problems with their udders… tiny, petite, and absolutely functional ’cause their calves grow like weeds. At least, that is our experience with our Lowline Angus… great moms & healthy calves. Because we are working on developing stock for the small farm, we decided to branch out a bit from the traditional milk cow and beef cow. Each have been bred for a specific purpose and if you have lots of room, they are generally your best bet to utilize. If I want a beef cow to give milk… I’ll probably have to give up milk quantity. If I want a milk cow to be good for meat… I will probably have to give up high-end quality meat (i.e. tenderness & taste). It will still be good, just not 5 star rated! 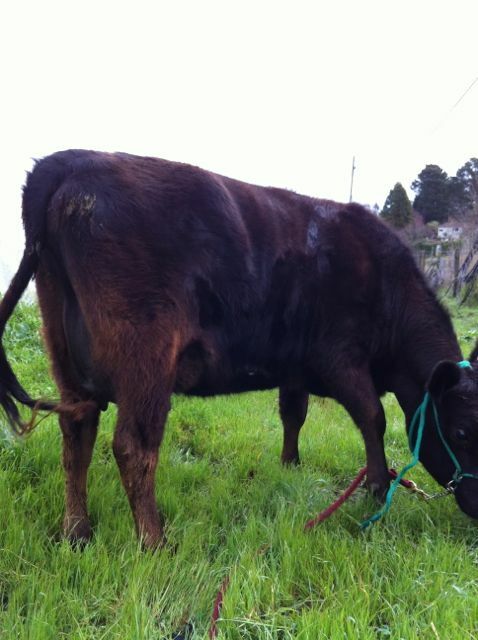 Cocoa, is our first result of crossbreeding a milk cow with a high-end mini-beef bull. She was a bit taller than we expected, her coat is darker than her mother (but not solid black like the Angus), and she has more of the dairy build with a more pronounced udder and excellent teat size and placement. Something you don’t really know until she has her first calf. (Bessie has teeny, tiny teats which makes hand milking very difficult!). I was running over in my head the need to take her into the milking trailer and just feeding her there a few times to get used to the space, adding the milk strap that goes over her back (which will hold the milk bucket under her), and in a few days, actually turn on the pump (noisy, although it IS placed outside the stall)… but letting her build up a tolerance to all the “new” stuff. All the while rubbing, brushing and sweet talking her. In the meantime, Job (our intern) goes out to the pasture, brings her into the stall. He just skips to the end and gets it DONE. Now I grant you, she needed some rear pressure to get her in the first time but once she discovered the fresh hay and a bit of grain she was a convert! The next day, she headed in without missing a beat, and Job, with his long legs stretched out under her, proceeded to hand milk her. I think, after milking her, he did turn on the pump so she could near the noise from it and realize that it wasn’t going to hurt her, or take her food! 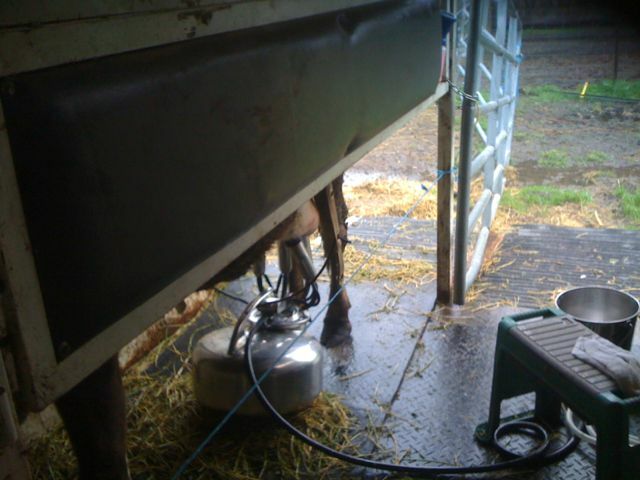 The next day… you guessed it, Job put the portable milk machine on her and that was that. Except, bless her udder, she gave more and more milk each day. Luscious sweet raw milk, with a rich yellow tint that speaks of lots of vitamins, from the pasture she has been on. 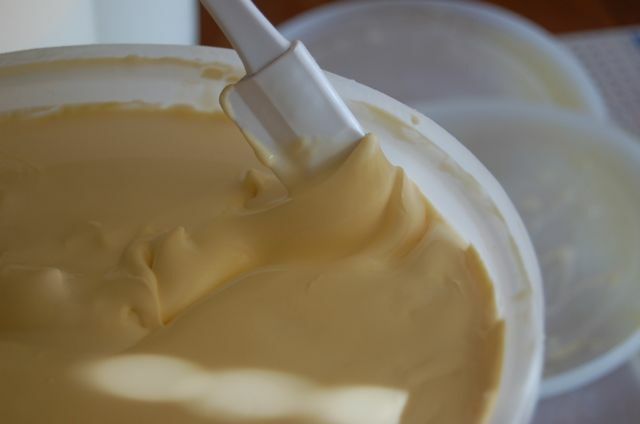 When the milk “settles” it has a layer thick with cream that we will harvest to make butter (or ice cream or real whipping cream). All my worry and problem-solving down the drain… Job just goes out and does it. Did I mention that he is brand new at this game? Awesome! It was wonderful to find that Cocoa has kept the best traits from her dairy side… while her bull calf will be valuable to the small acreage for very usable meat… he is 3/4 Lowline Angus and will have excellent genetics for quality beef. A Two-for-One package deal: milk and beef. We call that success! I have Lowlines and a mini Jersey and am planning to cross as an experiment in multipurpose mini cows. So far I only have a bull calf from the cross, but hope to see a heifer soon. I had never heard of anybody milking these yet and it is nice to hear you had a positive experience. My lowlines are very docile and so is my jersey so I am hoping the calves will be the same. sorry for the delay in responding! We did cross a Lowline & a Mini-Jersey, resulting in a Jer-Low heifer. After she calved, she was an excellent milk cow. Mellow and easy to milk. We tested for milk proteins in the Lowline and he was A2/A2, the Mini-Jersey was not. She was A1/A1, so the offspring was A2/A1. A1 & A2 refer to a milk protein. A2 is typically easier to digest so people who have lactose intolerance can drink the milk without any problem. A2 was identified later, so although it is an older protein, it is identified as A-2. A-1 is actually a portion mutation that occurred in more recent history and is more difficult for many people to digest… lactose intolerant. You can have your cows tested at UC Davis, very inexpensively, if you want to know their genetic status. A2/A2 milk sells for a premium. Whoops, except you can’t sell “raw milk”. It's important to take a critical look at what we are doing, and where we are headed, these days. About us: It’s all a journey!